Worksheet Systems is a database management platform that enables SMEs and bigger enterprises to build custom data solutions and business applications for managing vitally important data. The platform helps users organize spreadsheets in a centralized database solution where they can share and collaborate in a secure and controlled environment. All data solutions and custom business applications can be accessed from any device. Worksheet Systems custom databases enables users to handle simple customer / employee directories, product catalogs and inventories, and complex business processes that have outgrown bulky and error-prone spreadsheets. Users can define data tables for a customized data structure, as well as use query builders or write SQL, and build interactive dashboards. Worksheet Systems allows users to create multiple views of their data including a spreadsheet-like interface, and various charts. An audit trail keeps track of when changes were made and by whom. Users can import and export data at any time, and continuously update tables. Worksheet Systems leverages the advanced cloud system Microsoft Azure. All data passes through secure and encrypted channels (HTTPs). We use WorkSheet systems to store and analyse a large amount of regulatory data in a single place. It allowed us to deliver our solutions to our clients.I like the ability to be able to store large amounts of data combined with the possibility of analysing it, displaying it and work as if it was an Excel sheet _without_ the row limitations and without having to learn SQL. Our datasets have millions of rows which can easily break Excel, and the software allow us to develop and share custom dashboards for our clients. The company has been very responsive whenever we discuss some possible improvements, and we have noticed they have a very short production cycle to incorporate new features into the system. I like the ability to be able to store large amounts of data combined with the possibility of analysing it, displaying it and work as if it was an Excel sheet _without_ the row limitations and without having to learn SQL. Our datasets have millions of rows which can easily break Excel, and the software allow us to develop and share custom dashboards for our clients. The company has been very responsive whenever we discuss some possible improvements, and we have noticed they have a very short production cycle to incorporate new features into the system. Its easy to use like excel or access and user friendly application for database management, it enable uses to collaborate between users. Its good, I am unable to find any feature to dislike but pricing in high and not suitable for small business. Like any business, Mercanto runs on data. 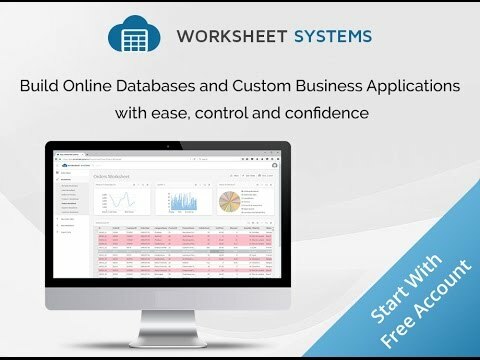 Worksheet Systems provides useful insights on our data and ensures decisions are made on accurate and up to date information.Worksheet Systems is as easy as Excel, and as powerful as SQL - if you need a user-friendly data management platform that offers collaboration and security features, it's definitely worth checking out. Worksheet Systems is as easy as Excel, and as powerful as SQL - if you need a user-friendly data management platform that offers collaboration and security features, it's definitely worth checking out. None really - happy with the experience. And if there's a user error, the system provides an audit trail that shows where the changes were made. Worksheet Systems brings clarity, transparency and structure to data, with easy-to-build online databases and custom business solutions that require no coding knowledge. Security and access control features include permissions that allow organizations to control who can see and edit data, as well as share worksheets for collaboration. The platform helps organizations maintain the consistency and integrity of data with customized data structures. Worksheet Systems enables users to create multiple views of data with a spreadsheet-like interface and various types of charts. All online data solutions and custom business applications can be accessed from any device. Below are some frequently asked questions for Worksheet Systems. Q. What type of pricing plans does Worksheet Systems offer? Q. Who are the typical users of Worksheet Systems? Q. What languages does Worksheet Systems support? Q. Does Worksheet Systems support mobile devices? Q. Does Worksheet Systems offer an API? No, Worksheet Systems does not have an API available. Q. What other apps does Worksheet Systems integrate with? Q. What level of support does Worksheet Systems offer?